Gathering information on what POS system is ideal for you just got a whole lot easier, visit www.EPICPos.com ! Pulse Solutions build the portal using PHP 5 and MySQL 5 in classic Lamp configuration. Our design team created an exceptionally light weight front-end thats both aesthetically pleasing as well as functionally user friendly. The website is on its way to become the industry standard for POS companies. 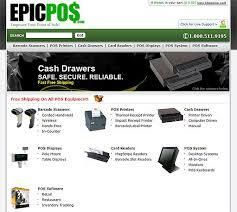 EpicPOS is a retail source for Point of Sale (POS) software, hardware and full system solutions. They are committed to providing the highest quality products at great prices. Equally important is their commitment to help enable the best match of equipment with each customer’s unique situation. With this commitment in mind, EpicPOS also serves as a full-spectrum source for advice and service. From pre-purchase research to post-purchase technical support, the company’s website, EpicPOS.com, hosts an ever changing array of product reviews, tips, articles, opinion polls, and a monthly newsletter. One service we are particularly proud to offer is our “Try before You Buy”. This service allows customers to try products out in their actual work environment prior to making a final product selection. EpicPOS focuses on providing excellent customer service and empowering business owners by providing a wide range of resources supporting customer self-education. EpicPOS provides clear, accurate information in the areas of Point of Sale (POS) and general business topics. EpicPOS staff monitors and participate in business forums to keep current with the needs and concerns of Point of Sale (POS) users and to offer helpful tips and assistance when questions regarding POS arise. Look for us on the web as a voice you can trust!